Well, I may as well go ahead and tell you, because soon it will be household news. I am, as industry sources have been leaking for months, at work on an epic poem on the subject of The Passing of Time and all of its Sickening Crimes. It will span volumes. It already has spaces slotted for it on the top of the New York Times best seller lists (fiction, non-fiction, how-to, and children’s), and I’ve booked some time on Oprah. It will be composed, in its entirety, in alternating dactylic tetrameter and anapestic hexameter. It will open with a chorus of anguished souls, and will rely heavily on deus ex machina, dramatic irony, and chiaroscuro. In one beautiful flight of fancy, entitled “Tempus Fugit? Indeed!” It will describe time personified as actual winged creatures, evolving from pteranodons to futuristic winged monkeys. In another section, entitled “Ripe,” the vista will open on a Russian farmer, who falls asleep in his fields on a warm day, and has a nightmarish vision of perfectly ripe fruit, just out of reach, rotting as he watches. Heavy, man! I don’t mean to get ahead of myself, but a rock opera is in the works, although it would be a breach of contract to describe the pop stars who are squabbling over the rights. In all seriousness, I was thinking about fruit as I scrubbed the bathrooms today. (No connection!) The life of fruit and vegetables is like a little parable of time passing. In broad terms, because you can measure summer’s sometimes everlasting, sometimes fleeting progress by the cycle of ripening produce. Spring is small, sweet greens, wild ramps, fiddleheads and peas. All bright green and young and hopeful. Midsummer is plump and bursting with an overabundance of fat tomatoes and juicy zucchini. And fall is sharp and bitter and colorful. And in narrower terms, in the life of each fruit and vegetable, ripe and perfect for such a small moment of time, and then withered and decayed, rotting on the vine. Or on my counter. I feel like I’m doing a good job keeping up with the veg, this year. I go through the CSA box fairly easily from week to week. But I keep buying fruit, because I love it, and the boys love it, and I want them to love it. And it’s summer! If not now, when? Of course I keep buying apples, because I’m addicted to them, and then I complain that they’re grey, and David reminds me that apples probably aren’t in season anywhere in the world at this time of year! So I had a glut of apples and peaches. What to do? When in doubt, I make a tart. This is a light and lovely tart. It has a hazelnut crust, a light coconut custard layer, a layer of fruit, and then a slight glaze of apricot jam. 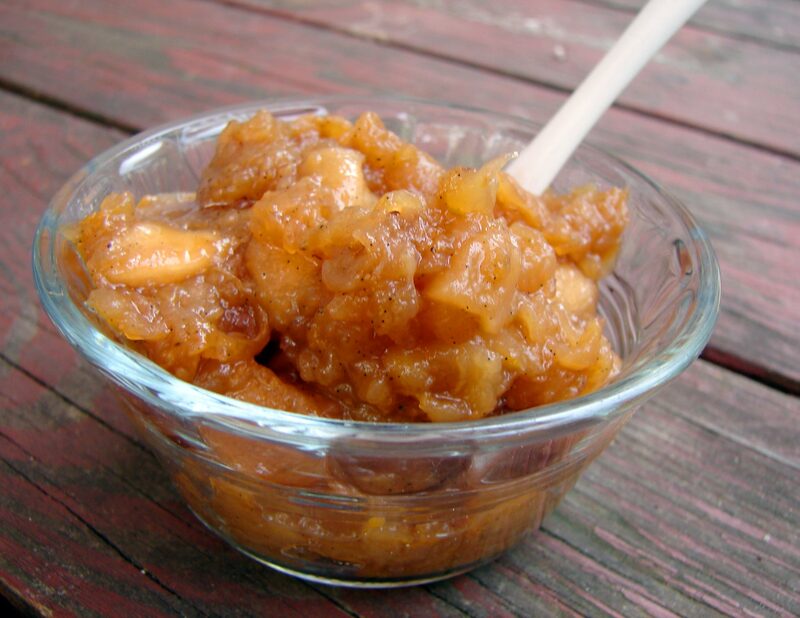 With the rest of the apples and peaches, I made a crazy-tasty applesauce with vanilla, balsamic and black pepper. It’s deep and rich and complicated – a little salty a little sweet. Nice with vanilla ice cream! Here’s Barbara Dane singing Woody Guthrie’s song Ramblin’. One of the most beautiful songs I know! As I go a ramblin’ ’round. Combine the flour, hazelnuts, salt, vanilla powder and brown sugar. Cut in the butter, and rub with your fingers till you have a coarse, crumb-like texture. Stir in the egg, and work till you have a smooth dough. Press the dough into a buttered tart pan, building up a rim at the edges to hold the custard in. Chill till the oven is preheated. Combine the coconut, flour, salt, sugar and milk in a processor, and process till fairly smooth, but still with pieces of coconut. Transfer to a bowl and beat in the rum and eggs till nice and smooth. Put the chilled dough in the oven for ten or fifteen minutes, till it loses some of its shininess. The edges shouldn’t fall too much. Meanwhile, cut up your fruit. I used 3 apples, 2 peaches, and about 1/2 cup blueberries. Cut the fruit in half, remove the pit/seedy core. Put the fruit cut-side-down on a cutting board, and cut around in 1/3 inch slices, angling your knife towards the center. Leave the fruit like this, you’ll just pick up the half a fruit, transfer it to the pie, and fan it out prettily when you get there. Pour the custard into the baked crust. Arrange the fruit prettily on top – any way you like, really!! 3 T apricot jam. Warm the jam till it’s quite thin, and drop it in dollops on the tart. Using a pastry brush or knife, spread it around a bit, but don’t worry about forming a perfect glaze. Bake the tart for nearly an hour at 350. The edges should start to brown, the custard will puff a bit through the fruit, and the fruit should soften. 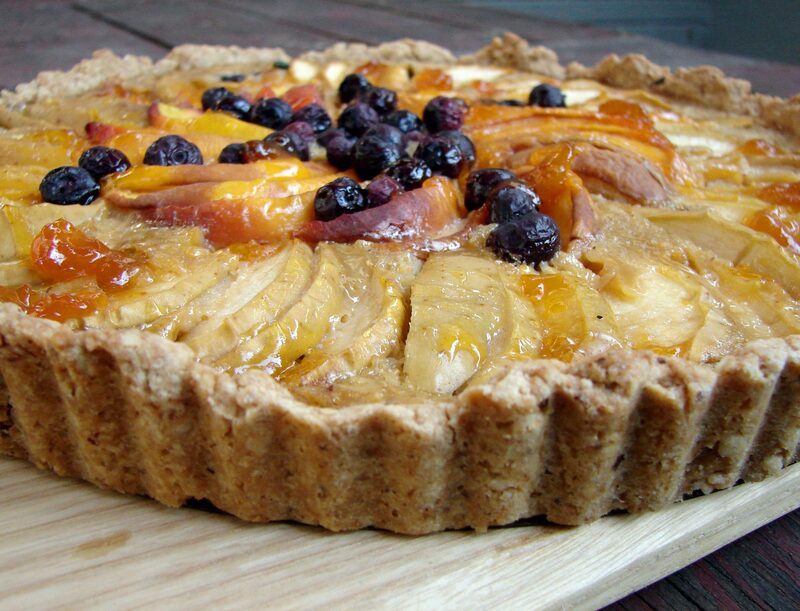 This entry was posted in crust, dessert, recipe and tagged apple sauce, apricot glaze, coconut custard, fruit tart, hazelnut crust, shortbread crust by Claire. Bookmark the permalink.